They say if you’ve got it flaunt it, but when you have reached a certain position in life, you don’t need to flaunt it, and it’s then that you are ready for the likes of the Patek Philippe 5101R 10 Days Tourbillon. A quick glance at the dial will show you what’s missing. It’s the tourbillon. You have paid out all that money for a fancy tourbillon with all its whirring wheels and steadily ticking cogs, but it simply isn’t there. In fact the only glimpse of it to be had is through the sapphire crystal on the caseback. The tourbillon is generally considered to be the ultimate complication as it compensates for the effect of gravity on the watch mechanics. The reality is the amount of difference is hardly noticeable. Modern watches are robust enough to compensate for a reasonable amount of movement without straying from precise time. That’s not an excuse to go playing the drums at a rock concert, but more than anything, you are really paying for the delight of watching the tourbillon go about its work. 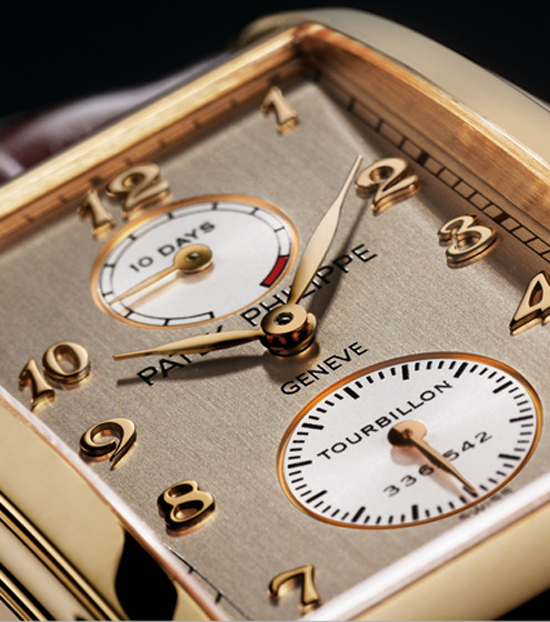 The only indication of a tourbillon on the dial of the 18k gold Patek Philippe 5101R 10 Days Tourbillon is the actual word ‘Tourbillon’ in the small seconds dial at 6 0’clock. But let nothing take away from the fact that this is a magnificent and high quality watch. The watch has a massive power reserve of ten days when the manually wound calibre 28-20/222 mechanical tourbillon based movement is fully wound and charged. A coupling system with a slipping bridle spring on the first mainspring barrel prevents overtightening of the mainspring and blocking of the spring barrels when fully wound. 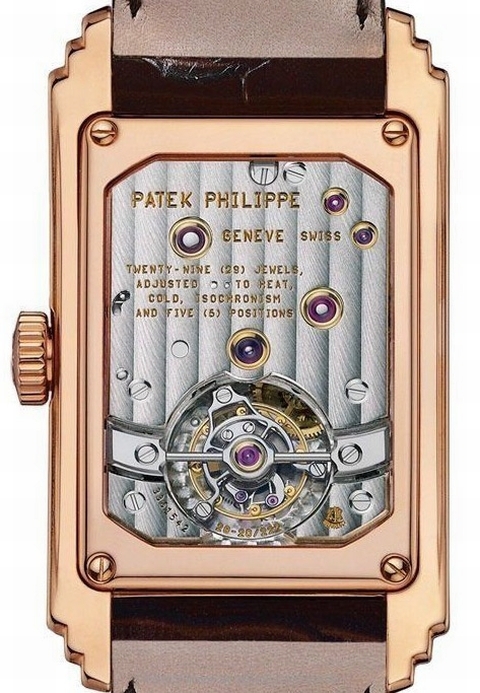 To achieve a ten day power reserve Patek Philippe inserted two barrels to store the energy. 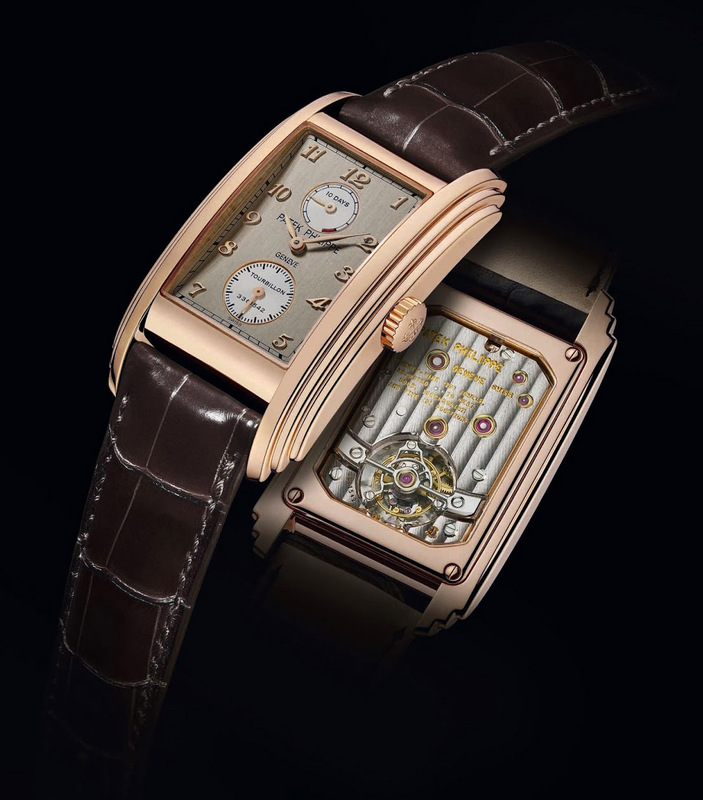 The introduction of the ten day power reserve in 2000 started a chain reaction of other manufactures producing four, six and eight day power reserves. Patek Philippe 5150R, can run accurately for 240 hours when fully wound. The advantage is it can easily be left off the wrist for a week without having to be corrected. To fully wind the watch requires approximately 100 turns of the crown, half a turn is already enough to provide an hour of stored power. The dial itself is impeccable, in grey with Breguet style Arabic numerals in rose gold running in two parallel lines down either side of the dial face. There’s a railway track minute indicator also running around the rectangular dial, and a simple, unpretentious power reserve indicator at 12 o’clock. It is disarmingly simple. Nothing is exaggerated, nothing is trying to show off. You will pay $395,000 or more for this watch, but few will know it, only you and those who truly understand watches will appreciate its quality and its worth. 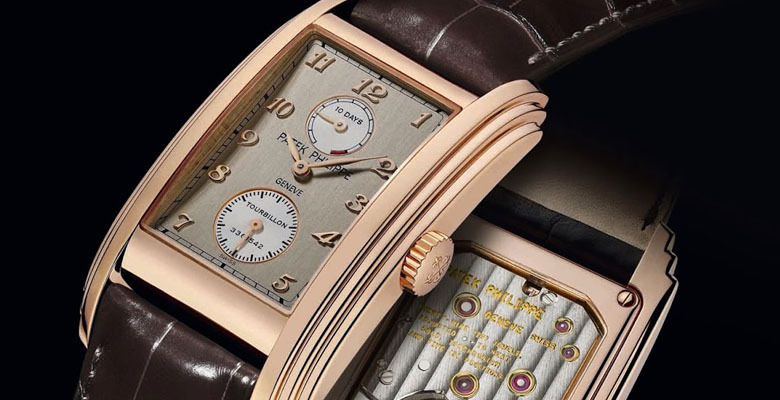 The anatomically curved stepped gold rose gold casing lends a 1920s or 1930s opulence to the watch, but at 51.7mm x 29.mm it’s designed to cover the wrist with a lot more watch than real 1930s art deco watches. The screwed sapphire-crystal case back reveals the meticulously decorated plate and bridges, the intricate tourbillon, and the jewels held in gold chatons. 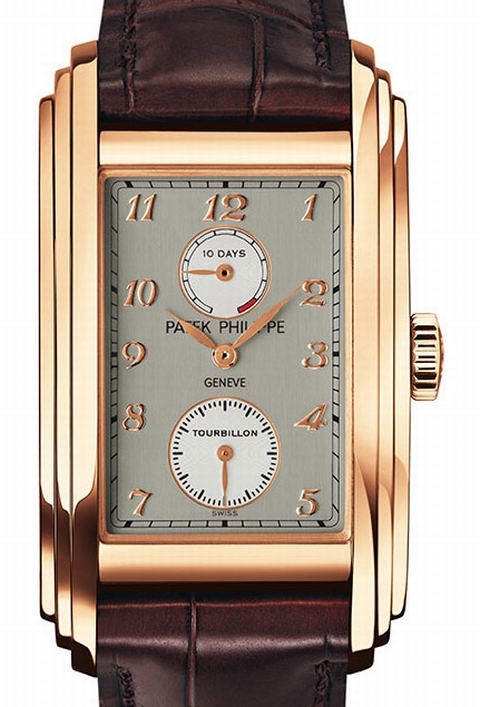 The Patek Philippe 5101R 10-Day Tourbillon with the rose gold case is worn on a hand-stitched, large scaled alligator strap with a matching rose gold buckle. Patek formerly introduced the same watch in platinum casing, but the warmth of the 18k rose gold seems to work even better. 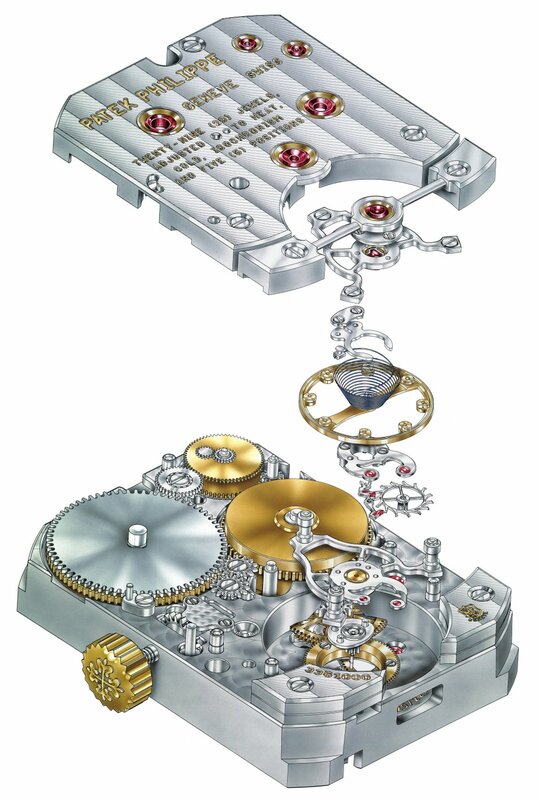 The watch consists of 72 individual parts that together weigh a mere 0.3 grams. All the steel parts of the filigreed cage are meticulously finished by hand. Are you willing to pay well over $300,000 for a tourbillon watch where the tourbillon is not visible? Patek Philippe believes so. 10 days’ power reserve, power-reserve indicator, and subsidiary seconds. 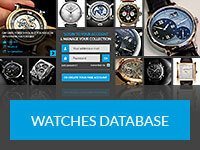 More resources about the Patek Philippe 5101R 10 Day Tourbillon on the Official Patek Philippe Website.